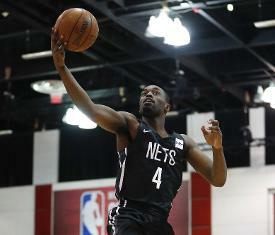 LAS VEGAS - The Brooklyn Nets are now 0-2 in NBA Summer League play after dropping a 90-76 decision to the Oklahoma City Thunder at Cox Pavilion Saturday afternoon. Brooklyn stormed out to a 9-2 lead just three minutes into the game and led for most of the first, but OKC took the edge late in that opening quarter and led the rest of the way, holding a 50-32 advantage at halftime and using their 41 percent shooting from the field to lead by as many as 30 at one point. The Nets had three players in double figures, led by Theo Pinson, who had a game-high 16 points and added five rebounds. James Webb III had 12 points and six boards, Yuta Watanabe added 13 points and five boards off the bench, and Trevor Thompson had eight points and a team-high seven rebounds. Brooklyn will have Sunday off before resuming Summer League play, an 11 p.m. ET tilt Monday night against the Minnesota Timberwolves. That is the last of the Nets' three round-robin games, and their record following Monday night will determine where they stand heading into Wednesday's single-elimination league championship tournament.